What do I get for post #2500? Oh and first on page 51?!? Ok...ok...I'll give ya a hint...it's a gun! First...for an education.....Model 63's in carbine form vs. the longer barreled rifle bring 100-150% more money. That means, double to double and a half for the carbine. Which model 63 is the imposter? ...or which one has been cut down? Well I'd say the one on the right is orignal but what do I know- I'm blinded by all those green & blue ammo boxes! Man! Six gets all the deals! Well, just got home. Kristy had to drive the Cherokee. Too much free beer for me! Talked old 99 Savages with a kid I know. Good time. Hey Jay...slamming down the cold ones huh?!?! That octagon barreled 1899 went for 7....decent gun all original but I did not like the rifling...it was there but worn rounded...no shine..pretty dark.....I've had my share of that shyt.....don't think it would be good with cast. Oh....neither 63's are imposters....the first 15K had the 20" barrel and the remaining 150,000+ had a 23" barrel. No way bro. Got home and Kristy brought me in a plate of cheese, sausage, kielbasa, and a cold beer! I married well!. Sorry about the 99, bud. It's all about the bore with me too! That's the mark of a shooter. The guy at the party just wanted a brass counter 300 to hunt with. Shouldn'tbe a problem. He asked me if I knew a guy in Bangor that collected. Said he had over a 100k in Winchesters. I gotta get out more! Well I made meat this afternoon. Not sure if I should post a pic or not. Pic is a little graphic for a family show. Long story short, 6 or 7 deer wandered through. This one was limping, right hind leg. I let her come to a stop about 50 yards out and put a Remington 20 ga slug through her brain pan. Congrats Gunny.....go ahead..post.....this is OUR post. We chased away all of the "board police". Even pitchy flew the coop because of our behavior.....maybe we should rename this post "The Wild Bunch". Pitchy....if your snooping, please rename this "The Wild Bunch". Ok Six just for you. I really had no intention to shoot a deer today, just out to hunt with a buddy of mine. But when this doe showed up limping I decided better I take her before the yotes got her. That shot was a whole lot more humane than anything Mother Nature had in store for her. You said 20 gauge but what gun? Savage 220 bolt. Remington 3" accutip slug. Itll shoot an honest 1-1&1/2 " 3 shot group at 100 if I do my part. I was in a ground blind and had a tripod rest so it was kinda a chip shot. I try to head shot as much as possible- no meat wasted ! So are you going to shoot some groups with your new acquisitions tomorrow? Wow, I disappear for a couple of days and miss 3 pages of stuff! Found two carts on Craigs list for a 5 note, one was missing it's stock engine, and the other had this Honda GX390 set up as a pony engine to run some kinda Rube Goldberg cable puller on the back... It was supposedly seized... it wasn't, just a little rusty, dropped some oil in the combustion chamber, let it soak, and put a pipe wrench to the crank and viola... it turned over. A little more work and investigation and IT RUNS! So, now I have a motor for the cart that lacked one. A lift kit, engine swap kit, and a little paint and buffin'... and I'll have my new gun cart! Not tomorrow but my Birthday is Wednesday and I took off. So maybe Wednesday. I had a buddy with one of those savages and his would cloverleaf lightfield slugs at 75 yards. I gave my son my old slug gun hmmmm do they make that it a left handed version? I believe savage DOES make the 220 in southpaw! It's a great "rifle", my only complaint is the way the mag catch works. Hey Griff you gotta post pics of the AFTER, gotta see what you are getting at. 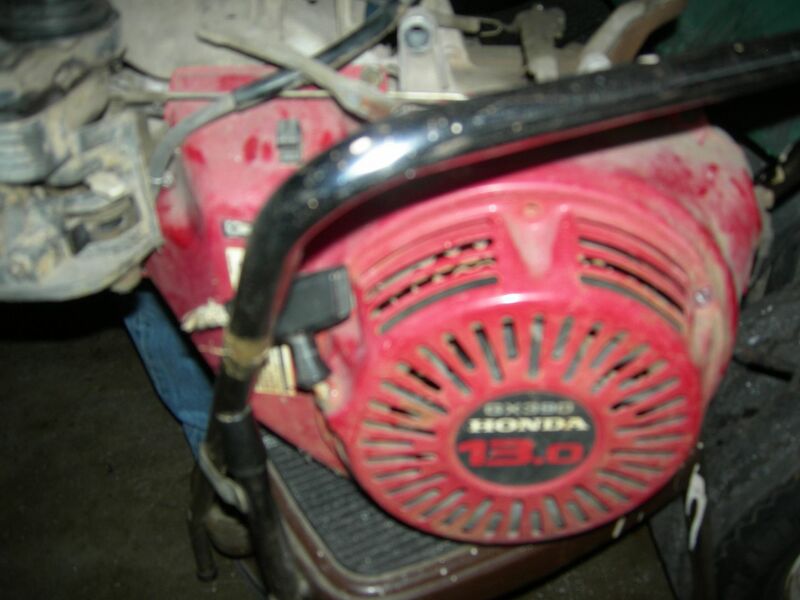 Cant beat those Honda engines! Gunny..GREAT shot! Instant DRT instead of a lingering death....good work! In addition to the two guns you won, I'm going to award you Fordwannabes Ford Diesel....that thing is huge...we were sitting in, with the heater on, rolling a joint, laughing and listening to Led Zepplin. Gunbroker revealed that Savage does indeed make that 220 with the bolt on the correct side, as well as all those defective ones. Jay, not only did you marry well, you also married above and beyond. Your a lucky dude. Does Kristy wear glasses? Now, go check those things your eating.....with the exception of the cheese and the beer, it seems like you like things that are long and cylindrical. Yep, I've got a similar model engine on my generator... it just goes & and goes. Keep the gas from varnishing the jets, and they're indestructible. Don't sweat it Six. I ain't thin skinned at all. And just so you know, Kristy is the lucky one. I'm a catch. Just don't tell her I said that. I like her to think I'm modest. 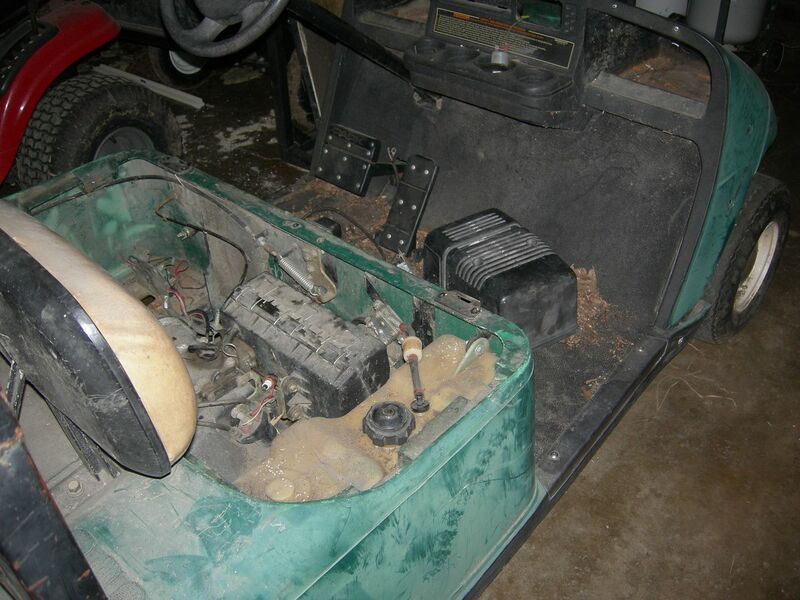 Griff, I know a guy that put a 16 hp Briggs in a golf cart. When all was said & done he found out the engine spun the wrong way- F was REVERSE and R was forward. That sucker was fast though! Thanks OW! My buddy I went with shot 2 yesterday, always does that at the farthest part of the property! Was a lot of dragging in the dark ! Well there ya go, a southpaw 220 slug gun! Ya not gonna trade off that 32-40 are ya?! NO NOT the Bee!! I'm sure Jack would buy them back...? I hear you Gunny. I HATE messing with deer in the woods in the dark. When I was young, I never did. Always popped em in the morning. The last 25 years it's always late. Hate it. Now I know someone (Six) will say I don't get up as early. Not true. I get up and out way earlier now than when I was young. No foolin! As a teenager I could sleep in with the best of them but I became a morning person, now I dont even use an alarm clock. Up at 4:45-5:15 everyday. If I'm lucky about every 6 months I might sleep until 6. Of course the girls make getting out of bed easier- nothing like having 3 pairs of eyes staring into your soul first thing in the morning! It's like I told that dispatcher once... I don't care what you want, I sleep between 2 & 5am... wouldn't you prefer that I do it in bed, rather than behind the wheel of this truck? Then again, my son sez that's because I take a couple naps watchin' TV!!!! I don't believe him, I can usually remember the plot of the show... ok, sometimes, but some of 'em are really boring! SURE Gunny think I can get a 220 lefty slug gun for this Shyt?. Wow a new slug gun after having all this old hand me down junk. A new gun. I prolly couldn’t find anybody dumb enough to make that trade so I guess I am stuck with these DAMnIT. I could probably be persuaded if ya twisted my arm! As usual, I'm the last to chime in. OK....for getting up early.....it was because since the dawn of man, he needed light to "get his shyt done". Now, we have artificial light. Who gives a F? As for early birds like Gunny, well, he is still a young man and has a lifestyle ...as to working...and the dogs....that require him to rise early. I don't give a F anymore. Except for cutting the grass, I can do anything about when I want to do it. (Well, last summer I did cut the pasture at between 9 and 11 PM..several times........the Kubota has bright lights). Went to bed last night at 10 and got up at 10...I call that "around the clock sleeping". We are now ......"The Wild Bunch". Let's start the orchestra.....violins, trombones, piano's, flutes, clarinets, harps, tubas, cellos, French horns, skin flutes, male organs, pipe organs, and celebrate! The "Fuhrer" is back! Let's all sit back and rejoice....pop open the champagne and we will delegate Jay to smoke the first skin cigar. Pitchy is snooping.....I knew it.........where would we be without our Fuhrer???? Six how did you change the name of my thread, change it back who ever did it. There`s a button to click on on the main page if ya want to start a thread of your own. Never mind i changed it back. Anyhow the girls did their usual stellar job. First flush was a bit of a stretch for the 28 with imp cyc around 40 yds but I folded the hen and Parker had to catch the cripple. She is learning! Next bird was a crosser, crumpled it 1 shot, 2 dogs on the retrieve. 3rd bird was a hit first barrel had to touch off the left barrel and dropped it about 50 yds . Then Claro tracked a chukar into the thickest pile of briars,grape vines, trees and she got herself stuck. Got herself turned around and flushed the bird. There I stood , gun open bs-ing with a guy- closed the gun & shot just that fast and dropped it, maybe a 6 yds shot. Glad some of my shot hit vines or that chukar woulda been ground up. It would be my understanding that only a moderator or myself can change a title of a thread without my permission and it would be against the rules for someone to do so without it. Wasn’t me! I can’t even post pictures. Welcome back Pitchy. I wouldn’t want to take advantage of you like that, Gunny. Hey restart.....only the moderators or the original poster can change the title....didn't you see my post above? I thought you saw my earlier post and changed it the "The Wild Bunch". I take it all back now...you are no longer the "Fuhrer". '........you have been demoted to "Minister of Propaganda" a.k.a. Joseph Goebbels". I barely know how to sign on to a computer let alone do savvy stuff. Last edited by Sixgun on Sun Feb 03, 2019 2:43 pm, edited 2 times in total. All i know is i didn`t change it. Ok that`s fine it`s fixed now. All I can say is I didnt change it, it occured when I was out keeping the skies free of Chinese chickens!!! Those sneaky chicoms are everywhere! Gunny you or anyone else couldn`t change it if they wanted to. Maybe just a misunderstanding by a Moderator. 46 here today - I was out in a tshirt ! We had 20's all day, was nice to work in garage with out being all bundled up. Put cedar handles on a damascus skinner and made 3 more antler handled butter knives! Kept dogs out and entertained most of day to. So with the cold snap over I let the shop stove go out a couple days ago. Cleaned it yesterday. This morning I fired it back up to chase the chill out. Hmm not much smoke coming out of the chimney. Out to the shop, open the door and I walk into a wall of smoke- WHAT THE ... fire is burning nicely, why the smoke.... dumbazz ya gotta open the flue for the smoke to go up & out!!! Now the fire is going, windows are open and fan sucking out the smoke. Its MONDAY right?! Need help plugging in the extension cord for the fan? Didn’t think so. We all make boo boos no harm no foul. Fortunately the fan cord reaches the outlets! Shop smells like a smoke house ! I'm thinking maybe I should smoke the shop early winter, maybe I can get rid of the chipmunks living in the walls!? How many of them little beggars do you have to smoke for a good meal though?